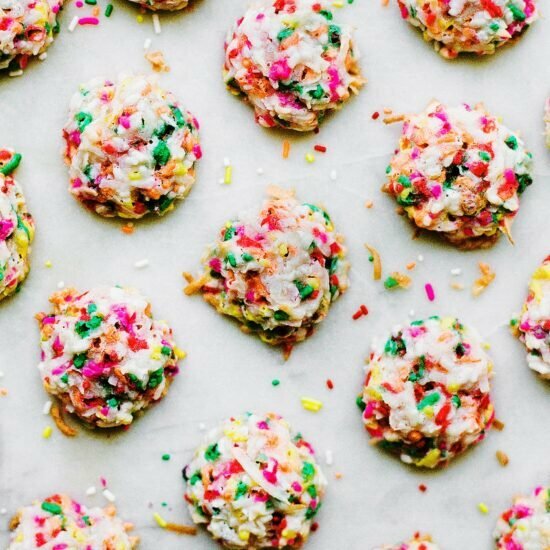 Funfetti Coconut Macaroons take less than 40 minutes and are ultra fun and colorful, perfect for a baby shower, bridal shower, or birthday party! No mixer required, and no condensed milk. Taste: Sweet with a hint of coconutty goodness. Texture: Slightly crunchy on the outside, and slightly moist on the inside. Every bite is heaven! Ease: Ridiculously quick and easy, just a few ingredients stirred together! Pros: Fun, colorful, and simple sweet recipe. When one of your favorite bloggers is having her first baby, it only seems natural to get together to celebrate her with a virtual baby shower! This post is in celebration of… SALLY from Sally’s Baking Addiction. I’m so excited we all get to celebrate her together, because I KNOW you guys love Sally and her website. I see you making her recipes all of the time, and it’s no wonder why! They’re super fun and always reliable, and Sally herself is just too sweet and incredibly hard working. She’s such an amazing part of our blogging community. It seems like I *just* published my Chocolate Frosted Sugar Cookie Bar recipe for Sally’s virtual bridal shower, but it’s been years. It’s crazy how fast time goes. 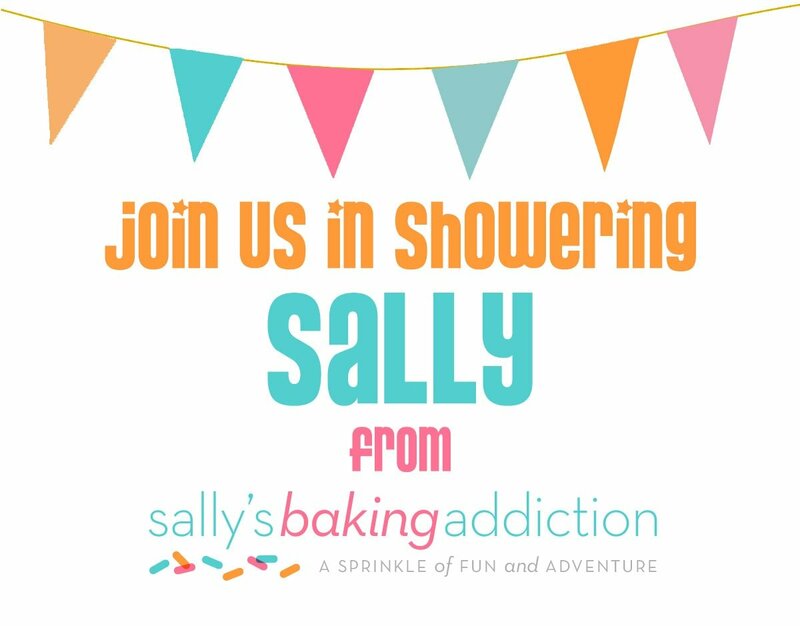 Since we all know Sally still loves sprinkles, that’s our theme for this virtual baby shower! 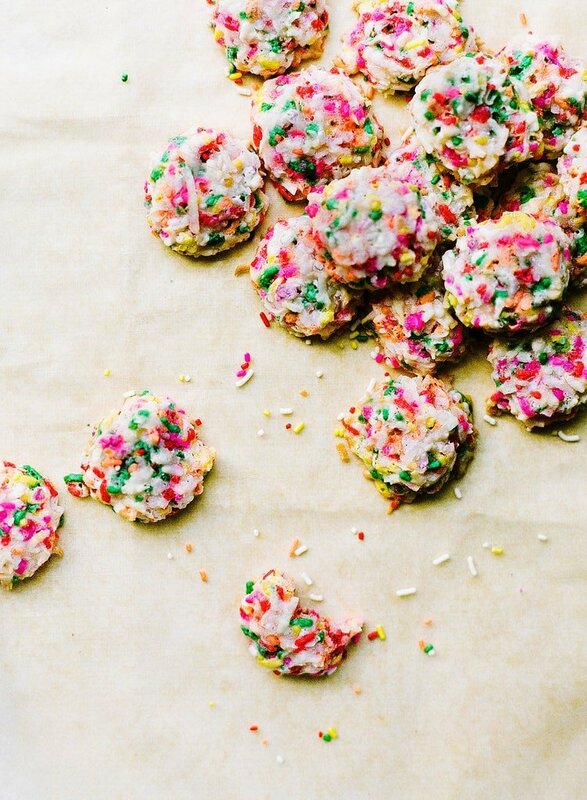 I chose to make Funfetti Coconut Macaroons. They’re stupid easy, super fast to make, and would be perfect on any special occasion dessert table. Scroll down to the bottom of this post to see the other recipes created by all of the other wonderful bloggers joining in for this shower. 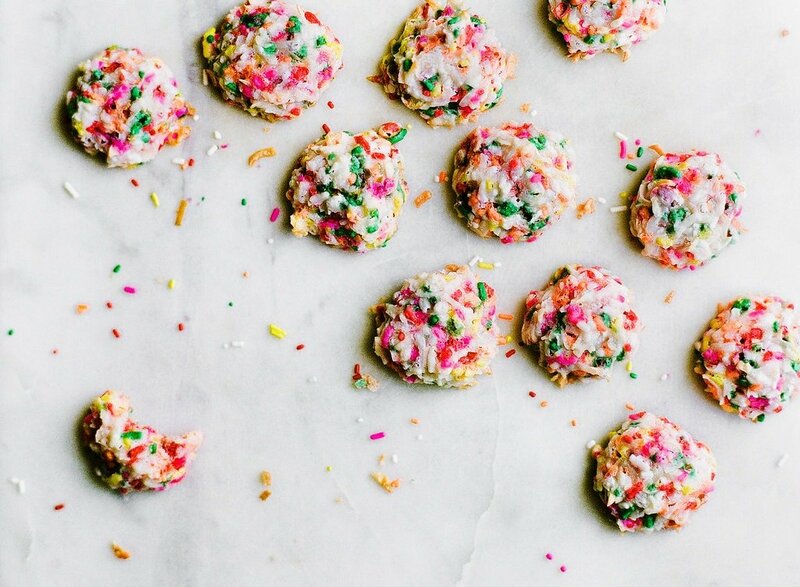 By the way, if you make and enjoy this Funfetti Coconut Macaroons recipe, be sure to snap a picture and share it on Instagram, tagging #handletheheat, so we can all see your creations! Preheat the oven to 325°F. Line a baking sheet with parchment paper. In a medium bowl combine the coconut, sugar, flour, and salt. Add the egg whites, vanilla, and sprinkles. Mix very well until everything is thoroughly coated in egg white. Form into 2-teaspoon sizes mounds onto the prepared pan, pressing down slightly to adhere. Bake for about 20 minutes, or until golden brown. Cool 10 minutes on the baking sheet before transferring to a rack to cool completely. Serve or store in an airtight container at room temperature for up to 5 days. Tessa! I was just thinking about the virtual bridal shower and cannot believe that was 3 years ago! I’m so lucky to have so many wonderful friends in this blogging world and so grateful for you. You continue to inspire me! Thank you for all the kind words and these macaroons are just too darn CUTE. Welp, these are freaking adorable!! And who doesn’t love coconut macaroons?! Perfect! These macaroons look super vibrant and tasty!! I love that you all teamed up to make the ultimate baby shower for Sally! Thanks for the recipe! I love coconut and these look fun and tasty. Tess, do you have a certain brand of sweetened shredded coconut that you use? I find that some brands I have bought just aren’t as good as others. Any help would be appreciated. Do you think these would make it in the mail? I think they would if packed carefully!